Thanks. Besides beautiful photos, I so often learn new things from you. You’re welcome. The photographer and the teacher coexist here. They certainly do, and all of us benefit 🙂 This is a nice counterpoint to the purple and white ones we have here. I so admire the soft sinuous shape. Thanks, Melissa. I wish I knew as much about plants as I do about math and language. I’m glad that’s your impression of it, just as I was glad to encounter this plant. Interesting facts about Samuel Dale. I like the facts some plants get their names after certain people, usually those who discovered or described them. That blue sky is a perfect background for the photo. Sometimes plants get named for people who discovered them, but other times plants get named for people who had little or nothing to do with them. Based on the article, it seems Dale wasn’t a botanist himself, but he did help with a botany book. I often use a blue sky as a way to isolate my subject. It’s convenient, at least as long as the sky is clear. How do you pronounce “Dalea”? I’m not sure I’ve ever heard anyone pronounce it. I pronounce scientific names to myself (i.e. in my head) in a Latin or semi-Latin way, with the vowels as Spanish inherited them: a = ah, e = eh, i = ee, o = oh, u = oo. That would make this genus Dah-leh-ah. At the same time, I wouldn’t be surprised if someone else played up the name Dale, making Dale-ee-uh. How have you been saying it? Do these continue to flower and fade their way up the inflorescence? I wonder if that has an influence on the sinuous character? I don’t often encounter this species, so I didn’t initially know. I wondered whether the flowers form near the tip of a lengthening inflorescence, as in frog fruit, but that’s not the case. In a photograph of another inflorescence, I see the flowers forming a ring around the core about two-thirds of the way down, with the upper two-thirds looking like the soft tip in this photograph. Apparently the whole core forms at one time and then the flowers sequentially open from the bottom up, as you thought. That other inflorescence was straight, so the sinuousity may be a late-stage development, and it may not happen in all cases. It looks as though it is about take wing and fly off into the deep blue yonder. I am pleased to know that the inflorescence is as soft as it looks. I’d be tempted to send you one so you could feel it for yourself, but the NZ customs officials would never let it in. Never, never, never……..although despite their very best efforts, some things do sneak in. I remember when we walked from the plane to customs in the Auckland airport, it seemed as if every few meters there was another sign warning about bringing in contraband articles. I wondered whether this bloomed the same way as the frog fruit, so I was glad for the added detail. It’s not at all what I think of when I call clover to mind, but it surely is a pretty thing. I see it’s native to Kansas, including Chase County (the Tallgrass prairie) but by the time I get there I suspect it won’t be in bloom. Still, the seedhead ought to be recognizable. 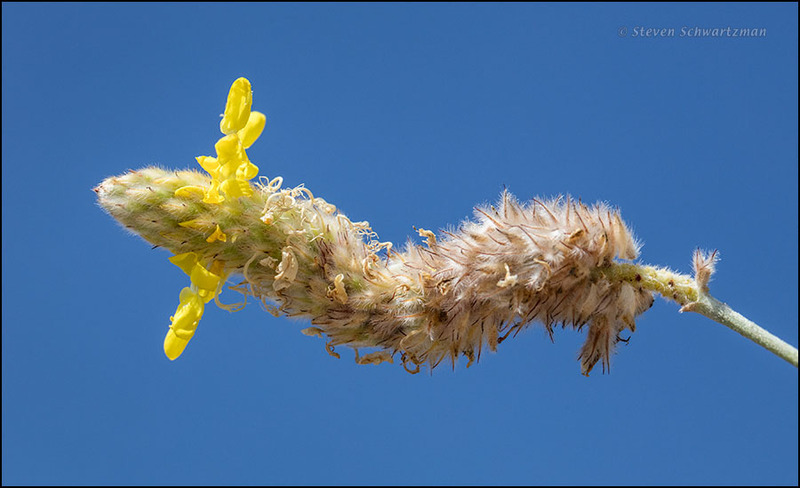 The tip of the inflorescence reminds me of bluebonnet buds. Yes, there is that resemblance at the tip to bluebonnets. I wonder if it’s a shared inheritance from being legumes or whether it’s merely coincidental. The “clover” name is indeed an indication of legume-ness, and I suspect people added the “prairie” to distinguish this genus from those of European clovers, two of which (white and yellow) are alien invasives in many parts of the United States, including Texas. And I forgot the low-growing purple and white ones that were in everyone’s lawn on Long Island, and that I didn’t know till decades later are alien.